I think I might be a genius. I had bought a carton of heavy cream, but after making two batches of (delicious) ice cream, there wasn’t quite enough for a third. But I really wanted some, so I dug around the fridge. 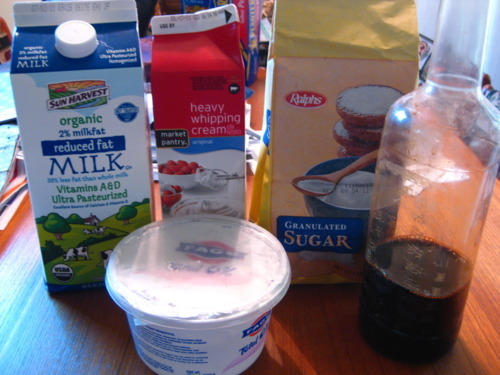 We also had an almost-empty carton of milk, and an almost-empty tub of nonfat Greek yogurt. So what did I do? I mixed them together. I was afraid this would fail miserably. 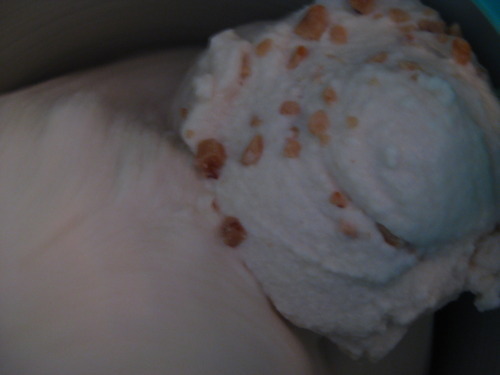 What makes ice cream creamy is all the fat. A lot of recipes call for heavy cream and whole milk, but I’ve been getting by with 2% just fine. But add nonfat yogurt into the mix? I was afraid it wouldn’t freeze right or taste as good. I was wrong. I decided to go with just plain old vanilla, that way I wouldn’t be too bummed if it didn’t work out. This WAS an experiment, after all. But once I realized it was fine, I did some improvising. It’s amazing what some toffee chips and “fudge topping” can do. 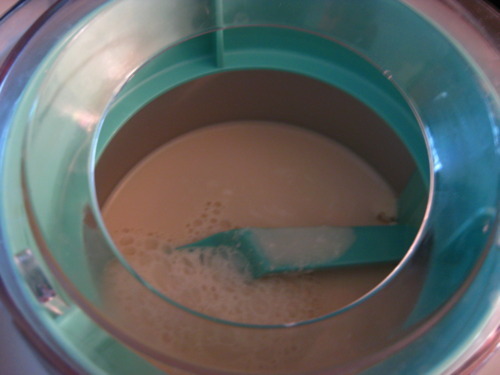 I adapted this from the little recipe booklet that came with my Cuisinart ice cream maker. The mix-ins. 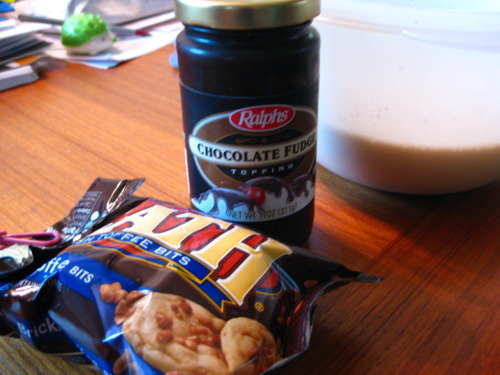 Keep in mind, you can always use other things like chopped nuts, chocolate chips, or nothing at all! 1. Put everything except toffee and fudge into a large bowl. 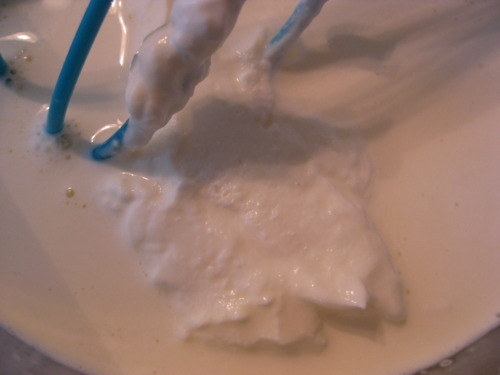 Use a hand mixer on low speed or a whisk to combine, making sure the yogurt is completely incorporated and the sugar is dissolved. Look at that chunky yogurt! 2. At this point, Cuisinart says you should chill the mixture in the fridge for 1-2 hours. You can if you want, but I didn’t. I mean, almost everything in there came from the fridge – what’s putting it back gonna do? 3. Freeze in your ice cream maker. It frothed up a bit at first… Never seen that before. 4. When it looks almost done, throw in the toffee. I don’t know how much, just do it until it looks like enough. You can never have too much toffee. 5. Beginning with ice cream, alternate layers of ice cream and fudge in whatever bowl you’ll be storing this in, kind of like marbling a cake. If that makes no sense to you, basically just throw in a little bit of fudge on top of every scoop of ice cream. Make sure the fudge isn’t too thick; you can spread it out with a spoon if you need to. 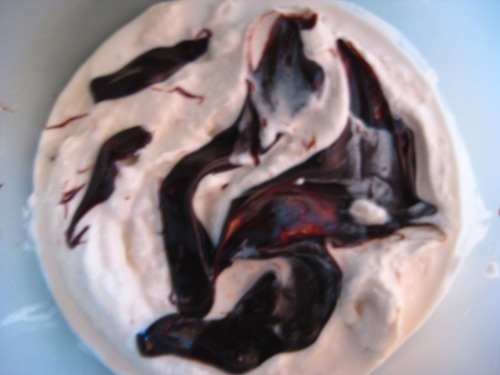 This will give you some nice fudge swirls when you scoop it out later to serve. 6. Throw this baby into the freezer for a couple hours so it will get a better consistency. Or eat it now, if you’re impatient. I won’t judge. This entry was posted in Dessert, Ice Cream, Sorbet, and Yogurt and tagged chocolate, vanilla by Alyssa G. Bookmark the permalink.